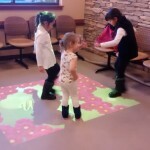 Kids gets engaged With MotionMagix interactive floor. Objective: To Engage Kids In Hospitals’ Waiting Area. Play is a very important part of every kid’s life, even when they are in pain. 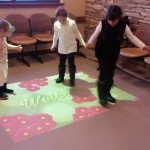 MotionMagixTM delivers innovative approach to engage children and their families by leveraging Interactive Floor technology. CBHA’s waiting area is converted into an interactive playground for children under medical care.